We believe a little bit of Ireland should be present in every home…but then, you could say we’re a little biased when it comes to all things Irish. However, if you agree with us then read on. We’ve selected a few choice Irish gifts for the home. Perfect for family, friends, or a wee treat to yourself during the Christmas season. We couldn’t recommend Irish gifts for the home without mentioning our own Irish plots of land. Every plot comes with a beautiful certificate, perfect for displaying in the home as a connection to Irish roots, both new and old. 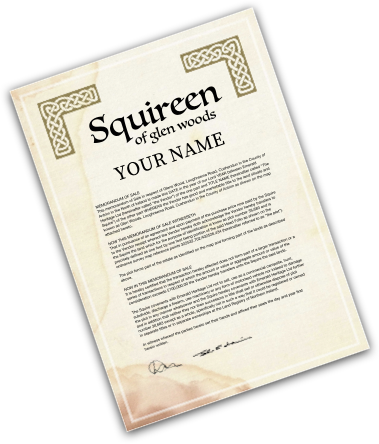 Every time you look at it you’ll be reminded of the beautiful Glendun wood, where the land is situated, as well as your part in helping us conserve the land and keep part of it green forever! To view our plots click here. Waterford Crystal, named after the city it’s produced in, is a classic Irish gift and a famous export worldwide. The company, which produces fine glassware in a variety of styles, was first established in 1783 before closing in 1851. It was eventually restarted in 1947 and grew to what we know today. One of the most famous pieces of Waterford Crystal is the World Snooker Masters trophy! A Celtic cross is a classic Irish gift that would traditionally be found in almost every home up and down the Emerald Isle. Tradition would dictate that the cross be set above, or close, to doors in the house to provide safe passage and return to the home. Ireland, alongside Scotland, is famous the world over for producing incredible whiskey and we believe every home should have a little taste on standby for celebrations and emergencies! From Bushmills to Jameson, Tullamore Dew to Powers, there are plenty of options to choose from. Just make sure you have the glassware to go with it. Belleek Pottery is an Irish home staple. The company, originally formed way back in the mid 1800s, has been running officially since 1884 and has its initial roots in the Great Hunger, also known as the Irish famine. Belleek, based in the village of the same name in Fermanagh, creates world-famous porcelain and includes the likes of Queen Victoria of England and the Prince of Wales amongst famous customers. Guinness is arguably Ireland’s most famous ever export (and we’re including U2 and St Patrick in that list!) and a little homage to the black stuff would work well in a private study, bar or kitchen at home. We really like the retro artwork from the 1950s, 1960s and 1970s. At one point Guinness and the iconic puffin design were synonymous with each other and we still love it to this day. Another classic Irish gift for the home is a vintage map of Ireland, framed for hanging on the wall. Avoca is a tiny little village in County Wicklow but for many, Avoca is the Irish company of the same name, famous for producing high quality throws and blankets. The mill, which is Ireland’s oldest working woolen mill, first opened its doors in 1723 and has been home to Avoca Handweavers ever since. Since the mid 1970s the company has been owned by the Pratt family and is famous for producing high quality, colourful throws and blankets, amongst many other parts of the business. What do you think? Have we missed a classic Irish gift that you think is blindingly obvious?